Hard at work in the heart of the prairies. Service to everywhere, welcome to Odelay! It's not just a name, it's an attitude of approach for each graphic design project we take on. The focus of our studio is creating unique visual experiences through print and digital media solutions for large to small clients. Our process is that we work together with you to identify your core values and transform them to custom visuals based on your brand, or we can define your visual brand for you. 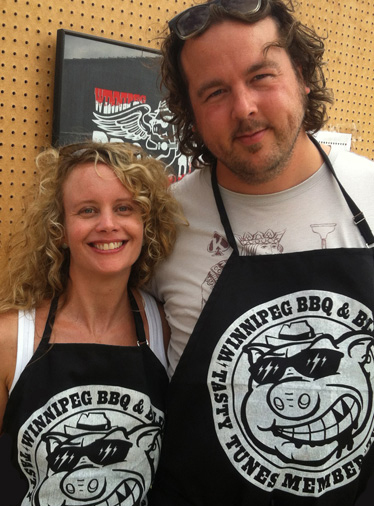 Jacqueline Germin, CGD & Craig Medwyduk, CGD are award winning professional graphic designers and screen printers. They have combined forces to create the super studio known as Odelay! perspectives, applying unity, then adding the magic Odelay! sprinkles. A collection of music over 3 days in Saskatoon at 4 venues, but it is not a festival. A graphic 'bug' that can be used without the full identity. Visual identity for a new startup in Berlin focused on creating a digital rights legacy for digitally created content. Limited edition screenprinted poster for Whitehorse shows at the Broadway Theatre, Saskatoon, SK. Screenprinted Christmas promo poster with tear away coupons. New logo for Northern Lights Bluegrass & Old Tyme Music Festival. Identity for a summer music festival in Northern Saskatchewan. Paw Pals offers students aged six to twelve an interactive and imaginative educational experience interwoven with Saskatchewan curriculum outcomes. Students correspond with Moe, a Saskatoon SPCA alumni, and learn important character building tools. Custom screen printing and extra bling for this, the king of signs. Identity for the Saskatchewan Jazz Society's nightclub located in Saskatoon. Screenprinted poster for the artist Bahamas. Limited edition screenprinted poster for the Shane Koyczan show at the Broadway Theatre, Saskatoon, SK. Online presence for CUT, all shows, streaming 24/7. 2 show posters in action for events at The Broadway Theatre. Odelay! was asked to be a part of this gallery exhibit on paper. Screenprinted poster for the Vinyl Diner, Record Store Day 2015. Fists of fury graphic created for one of Winnipeg's best head shops. Pretty cool to see Manitoba's Premier approve our work. Poster design to promote the event. Posters for the event, and for the trolley transportation, makes for a fun night! Fun advertisements for films showing at The Broadway Theatre. Presenter and Performer street banners surrounded the MTS Centre in Winnipeg. Original illustration for the Winnipeg street wear company. Designed and illustrated this show poster for The Sadies in Saskatoon. Unique business card for this unique event centre located in Saskatoon. Simple 2 colour poster for a Winnipeg retail store. A graphic to promote the Society of Graphic Designers Learning Lunch series. Cards that mimic a ticket to showcase the vertical logo. Our friends at Champion Design hired us to create a wrap for the new zero emission electric bus. Created characters and set them to motion for television and online. As well stills for billboards and print. Promotion for the 2009 edition of the festival. After creating a limited screen print of the iconic ride, we were hired to create film titles for the short “Polar Express” by Karen Asmundson. Postcards to promote the Saskatoon based photographer. Nightclubs across the province were given entrance stamps to promote The Year of Music in Manitoba. Design and illustration for CD release. Identity for the 2015 Awards in Winnipeg. 2 posters in action for events at The Broadway Theatre. Designed a visual identity for the landmark community owned Saskatoon theatre. Multi-use visual identity for the Annual Jazz Festival in Saskatoon. Album design for the Urban Star television series. Designed a defining card with multiple backsides. Day and night banners for events and conferences to promote The Year of Music in Manitoba. Business card to promote this Saskatoon based travel agency. First run film poster for the 2012 Sean Garrity film. Double sided tshirt based on the hit song Smokes 'N Chicken. Twelve month calendar to promote this Saskatoon based photographer. Clean and effective visual identity for this independent Saskatoon publisher. Poster to promote the Vinyl Diner on Record Store Day 2014. Traditional print ads were created to promote The Year of Music in Manitoba. Web presence for the national 45+ employment agency Third Quarter. Designed identity and support materials to commemorate WWI Soldiers who were students at the U of S.
Billboards to promote the 2007 edition of the Festival. Contact us today to create the visuals for your next great event. The province of Manitoba announced 2014 is the Year of Music in Manitoba. We created an online and street presence to get the word out. Die cut business card to showcase the Saskatoon photographer's work. Book design for this local Saskatoon independent publisher. Promotion for the 2009 festival. Easy on the eyes identity for the Saskatoon vision centre. Shirt design for the Winnipeg streetwear company. Poster to promote the 2007 edition of the festival. Promotional poster for the Saskatoon based photographer. Ladies' graphics tshirts for summer 2014. Simple and clean logo for the Saskatoon photographer. Shirt graphic for 2012 European tour. Colourful cards to showcase this speech language pathology company. Visual Identity for the event retreat centre located in Saskatoon. A folder for new clients who use Hire Experiences services. A fun shirt to commemorate this Saskatoon hockey legend. Promotion for the 2007 edition of the festival. Book design for a Saskatoon publisher. Character creation for this urban hip hop artist. Poster to promote the Children's festival in Saskatoon. Information brochure on education equity. Book design for the Saskatoon publisher. Large banners created to showcase the Saskatoon photographer's work. Design and illustration to promote the show. Typographic solution for this Saskatoon based leadership consulting company. Limited screen printed posters for the 2013 festival. Poster to promote the 2009 edition of the festival. To the point solution for this Saskatoon based speech language pathologist. Informational banners to promote using mustard in cooking. The prestige of the members only country club in Saskatoon. Signs to promote upcoming sales and promotions. Coil format recipe book to promote the use of mustard in cooking. Prarie yellows and greens keep this Sask Mustard logo flowing. Poster to promote this fundraising event. Brochure used for students who want to study abroad. Publication to promote the summer activities at this Northern Saskatchewan campus. Information about working with your vision care centre. Fundraiser event for MS Walk for a Cure. Need to travel? Ultimate Destinations with this clean packed logo can help. Album design for this country rock band. 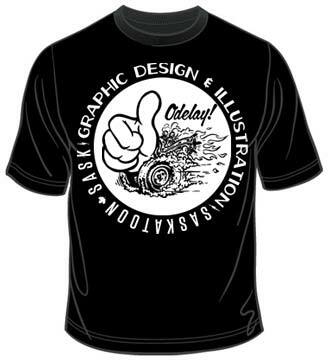 Designed & printed by Odelay! 2019 © Jacqueline Germin, Craig J Medwyduk, or Odelay Graphic Design. Programmed by Visual Lizard.